Generous, humanitarian, self-sufficient, proud, self-sacrificing. You are the humanitarian. You are attracted to a cause or a movement whose purpose is to make a better world. You are extremely idealistic, sometimes to the point of being naive about people or methods. You have great compassion and seek to create a more humane society. You are drawn to those who suffer physically or are at the hand of injustice. You are the righter of wrongs. Your deepest intention is to transform the world. You are willing to sacrifice in order to advance your cause. Indeed, this seems to be a theme in your life. From time to time, you find yourself involved in a project whose very life depends upon your willingness to sacrifice something that relates directly to your ego. You are highly idealistic. You are also a visionary, with the ability to influence and direct the masses. Deep inside, you long for the love and approval of the many, and seek fame. Part of your hunger for fame has to do with your need for validation; you are your own harshest critic. You realize your greatest satisfaction when you are involved in some activity that directly benefits the public good. Politics, law, protection of the environment, teaching, and healing are areas in which you would succeed. You have a broad view of humanity and are not shackled with prejudice. You should have friends and associates from all walks of life, all colors and religious backgrounds. People fascinate and enrich you. A wide diversity of people and experiences stimulate and bring forth qualities within you that would otherwise lay dormant. You have an abundance of artistic talent. Many with your Expression number find themselves in the arts, especially in literature, painting, and the visual and performing arts. 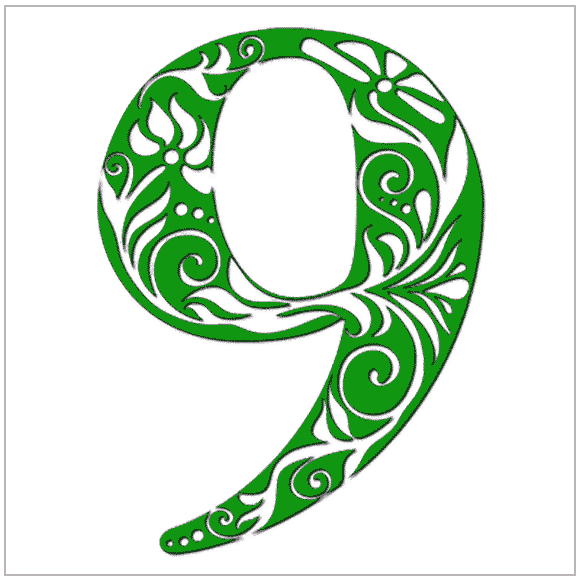 The number 9 indicates the completion of a cycle or a block of learning. The 9 Expression suggests that you have reached the point where a breakthrough can occur; during this lifetime you can apply all that you have learned along your evolutionary path and complete a major stage in your development. This is why we find many geniuses with the 9 Expression. You have the ability to synthesize many diverse bits of knowledge into a unified whole. You are keenly aware of how others perceive you. As a result, others see you as a person with a great deal of control. Conversely, you are charismatic. Despite the cool and distant personality you project, people are attracted to you. You tend to express your love somewhat impersonally. You tend to be preoccupied with your vision or cause, and sometimes overlook the needs of those closest to you. You need to be reminded to give your love more personally and more openly. Ironically, you are a very loving and sincere person, but often neglect to express what you truly feel. In the same way, you can overlook your own needs. You can avoid sharing of your deeper feelings, creating a reservoir of emotion. You tend to postpone your personal satisfaction in favor of some larger work. Try to be more spontaneous and courageous about showing your real self, including your vulnerability. Your basic belief in the goodness of humanity is unshakeable. This causes you to encourage the best in people, but occasionally makes you vulnerable to being taken advantage of. You are not a very good judge of character. The surest way to personal satisfaction is for you to become part of some larger social cause. Your nature is to serve. You are happiest when you feel you are helping to advance the human race. Go on to read about: Your Heart's Desire number!